Container gardening likely began in ancient Egypt. In his book, Six Thousand Years Up the Garden Path, the late Ian Robertson, an internationally known garden designer, indicated that Pharaoh Ramesses III was a major force in defining horticulture. Of course, Ramesses didn't have a mail-order plant nursery like Flowers by the Sea to help him determine what to grow and how to do it. He also didn't have three-day mail delivery. His fig trees and papyrus plants traveled by desert caravan and river barges. Yet Ramesses persisted. According to Robertson, it was during the pharaoh's 32-year reign (he died in 1156 BCE) that the "probable first use of containers for growing plants" began. In her Handbook to Life in Ancient Egypt, historian Ann Rosalie David notes that a document called the Great Papyrus Harris indicates that Ramesses created "garden cities." 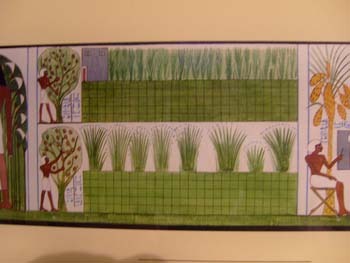 The next time Arbor Day arrives or you water your potted plants, think of Ramesses's efforts to create oases for his people. He is said to have used containers for a massive program of planting trees and shrubbery in the more than 500 formal gardens he created. He managed this feat while defending his country against invasions leading to three major wars. Container gardens are tiny oases that you can enjoy up close and at home. Whether your outdoor growing space is spacious or as limited as a balcony, planters filled with low water Salvias and other, similarly undemanding plants add color, fragrance and form to your surroundings while being easy to tend. You can even irrigate them with gray water from your shower. Due to their portability, container gardens allow you to move pots when weather conditions change. You can cozy them up to your house during a snowstorm or tuck them under the eaves when rain turns to hale. If it gets too hot for your full sun plantings, you can move them into the shade for a brief respite. Container gardens are the ultimate flexible landscaping. They expand the idea of growing the right plant in the right place. They can even help provide the right food for insects and birds that aid plant pollination. Bees, butterflies and hummingbirds visit plants rich in nectar and pollen whether they grow in the ground or in containers. 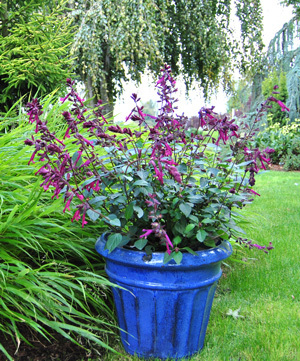 Many of their favorite Salvias thrive in containers, although they may grow to smaller sizes than they would in the ground. Ramesses' public works projects make the project of home landscaping seem less daunting. Nevertheless, at FBTS, we understand that most gardeners have few if any minions to assist with planning and planting. Selecting combinations of plants that look good together, share similar basic needs and grow well in containers can be time consuming. We decided you might appreciate some help. So FBTS offers a pre-planned selection of sages and companion plants with similar growing needs -- such as full sun, partial shade or full shade -- and lets you choose a combination of three for each Container Kit. The plants are divided into thrillers, spillers and fillers. You select one plant from each category. A thriller is the central focus of a container garden, whereas a spiller is a trailing plant. The filler adds interest and volume without taking center stage. Overall, our Container Kits are excellent shortcuts to planning potted gardens. They are starting points around which you may choose to add other planters or in-ground plantings. At FBTS, we strive to provide the know-how you need -- as well as quality plants -- for a beautiful Salvia garden. "Gardens of Nakh 2" by SiefkinDR - Own work. My plants arrived in excellent condition! They are bigger and better than any plant I've ever ordered, by far. One plant could not be shipped so I called, and their customer service rep was SO polite and helpful. I'll definitely place more orders with them!